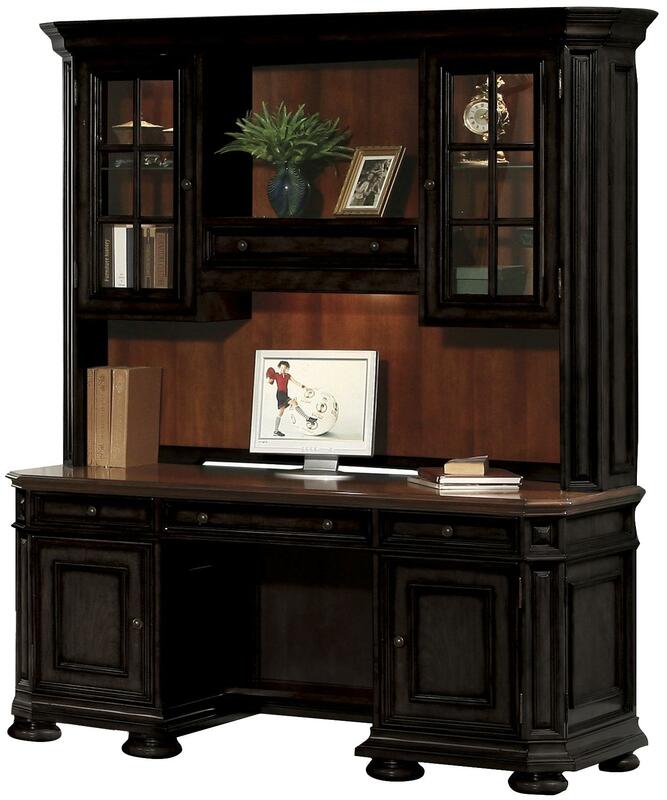 Shown with Coordinating Sliding Bookcase, Executive Desk, and Lateral File Cabinet. 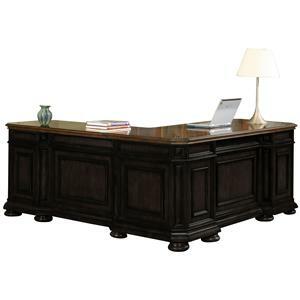 Add an incredible storage, organizational, and work space in your home with this credenza and hutch combination. Completed in a gorgeous rubbed black finish, with cherry finish accents, featuring storage drawers, wood and glass doors, five shelves, embedded lighting, and computer ready construction, this credenza and hutch combination is a furniture piece that is as functional as it is beautiful. 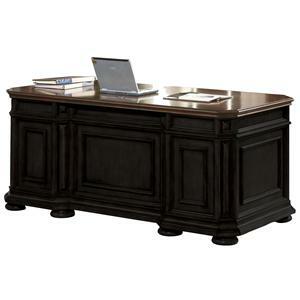 Pair it with the coordinating executive desk for a commanding, elegant, and stately home office today. The Allegro RS Credenza and Hutch by Riverside Furniture at Value City Furniture in the New Jersey, NJ, Staten Island, Hoboken area. Product availability may vary. Contact us for the most current availability on this product. 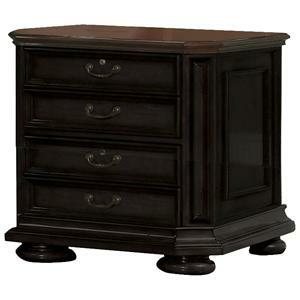 44726 Computer Credenza 1 66.75" 25.5" 30.5"
44727 Credenza Hutch 1 69.5" 15.75" 51.75"
Finish Rubbed Black finish with Cherry accents. Handles & Hardware Burnished knob pull and handle pull hardware outfit these case pieces. Case Detail Panel moulding, bun feet, and clean, straight edges outfit this rich collection. Drawer / Shelf Construction Dovetail joinery. Drawer Suspension Ball bearing drawer guides. Wire Management Found on Credenza with Hutch combination. 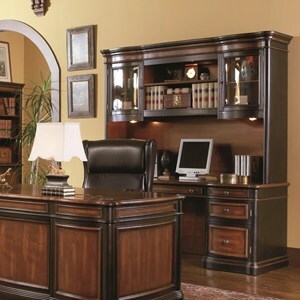 The Allegro collection is a beautiful compilation of sleek, elegant, and stately office furniture for your home. 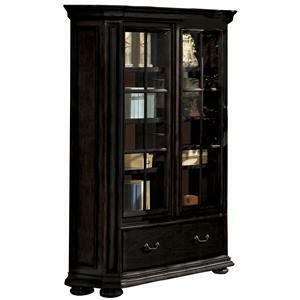 Featuring a Rubbed Black finish with Cherry finish accents, a functional variety of storage and display options, rich moulding and paneling, and embedded lighting accents, this group of home office furniture creates a commanding presence and adds smartly designed, and lasting furniture additions to your home. Rich handle and knob pull hardware accents, as well as file storage and more, make this collection a timeless masterpiece for your home. The Allegro RS collection is a great option if you are looking for Traditional furniture in the New Jersey, NJ, Staten Island, Hoboken area. Browse other items in the Allegro RS collection from Value City Furniture in the New Jersey, NJ, Staten Island, Hoboken area.